I started in the MDK on the 10-01-1977, in Glyfada (area of Athens) at the age of 16 then. A friend of the family introduced me to the Do Jang (Tang Soo Do) at that time as I was looking to join a Karate school. The friend was already a Red belt member so that was my first contact with TSD-SBD. Since then I have been training and following all the activities here in Greece and in Europe. I had a break off from teaching and training for about 8-9 years due to work priorities that had to be done. I earned my Cho Dan on the 20-03-1980 in the 65th classing championship of Tang Soo Do. In 1984 after my 2 year military service I tested for Ee Dan and in 1989 for Sam Dan. 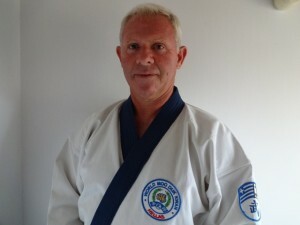 My Instructor at the time was Lee Khun Hwa Yuk Dan with Dan bon 8321. In 2003 I tested in the 1st KDJ in Europe on Agistri island in Greece for Sa Dan and earned my O Dan on 10-05-2010 in the 125th Dan classing. I opened my first Do Jang on the island of Syros in 1984 and stayed there for 3 years. I left at the end of 1986 to go to the island of Crete and since 1987 I have been living on Crete. I opened my second Do Jang in Crete in 1998 and since then I have been teaching on a regular basis. Soo Bahk Do in one way for me is a full time job during the 7 months of the year and the rest of the 5 months it goes parallel with my summer job which is a Scuba Diving Center which I run here in Crete. One of the highlights as a member of the Moo Duk kwan is the Organization of the 1st in Europe Symposium in 2006 in Crete-Greece. 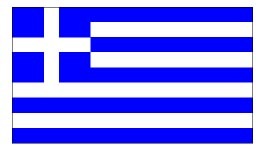 In the beginning of this year 2013 I have been appointed as TAC chair in the Greek SBDMDK federation and Designee for Greece. The current active Dojangs in my country are 12 with another 2 opening by the end of the year. My original MDK instructor was GEORGE R.PAGE SBN with Dan Bon 11772.